Wingspan is 60 mm will find them on rotten fruit . Don’t like grass will find them flying low were it is sandy or rocky ground. 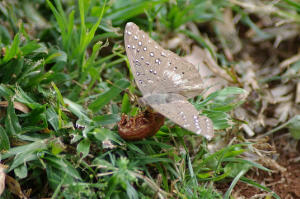 Very alert , larvae feed on Combretum molle and Terminalia sericea. I took this photo in Nelspruit but normally will find in Thornveld and savanna. I loved walking and following this Guinea Fowl.